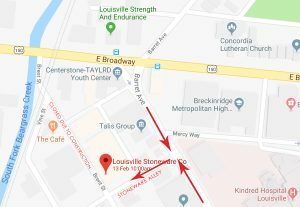 VISIT US | Stoneware & Co.
Our entrance is located off Stoneware Alley between Barret Avenue and Brent Streets with ample parking in the lot and on Brent. We know it is a little difficult getting to us right now due to the closure of Brent St. while we work on the neighborhood renovations. You can still enter off of Barret Ave. onto Stoneware Alley. Turn off of E. Broadway onto Barret Ave. south towards the Highlands. 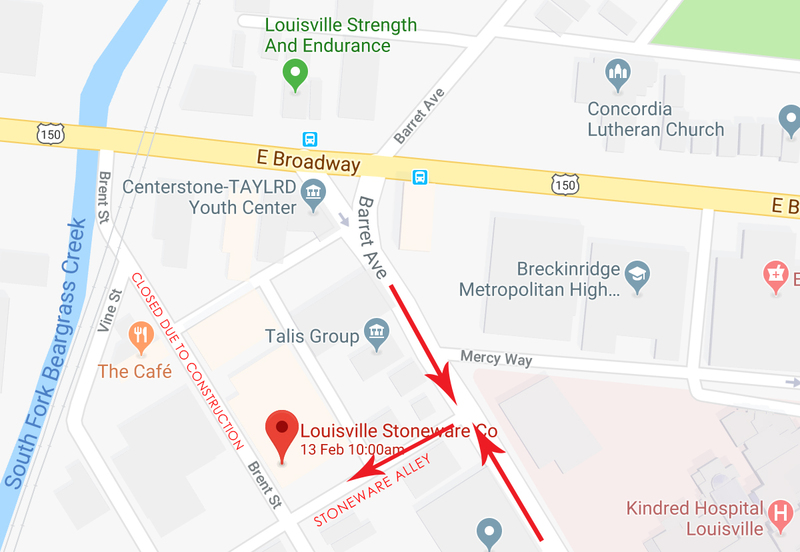 You will see Stoneware Alley on your right 453 ft. from the intersection of E. Broadway and Barret Ave. If you need any further assistance please give us a call at 502-582-1900. Paint Your Own Studio: Opens Monday – Saturday at 10 am, last seating at 3:30 pm. Factory Tours: Monday – Friday at 10:30 am and 1:30 pm, or by appointment for groups.